Fitbit was one of the first fitness tracker companies that gained fame with their innovative line of fitness tracking devices that could count your steps and remind you to get moving. The idea was simple enough, create a device that will allow people to closely monitor their activity level, so they can improve how active they are throughout the day and finally see weight loss results. But the design itself was very basic and limited. But over the years, they’ve come a long way, improving functionality and step counting accuracy, not to mention offering a wider range of features designed to teach you how to burn fat without losing muscle and drop weight rapidly. 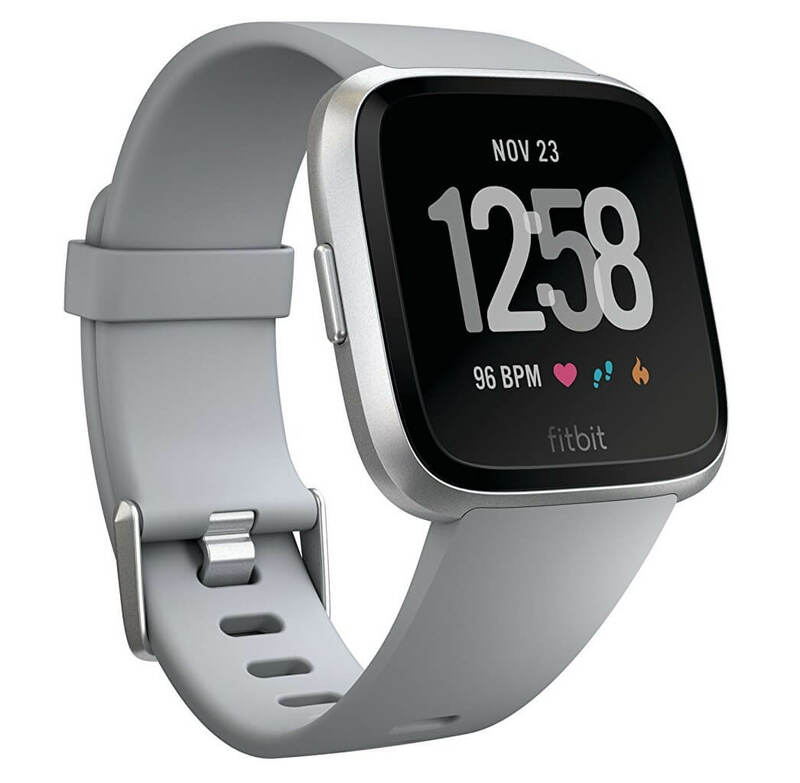 Their newest model, the Fitbit Versa, comes loaded with some great features that will motivate you to get moving, allow you to more precisely track activities, and can even help you track your sleep pattern. Our Verdict: Unlike competing models, this fitness tracker doesn’t come with built-in GPS capability, which can be a major drawback for the runner or cyclist, or basically anyone who wants to keep close tabs on their progress based on routes. However, for the price, this model offers the type of user experience and fitness tracking capabilities that the beginner on a budget is looking for. If you can live with a fitness tracker that doesn’t have GPS, then this model is an excellent choice and one that can potentially save you hundreds of dollars compared to competing models that go for twice the price. Read on to learn what the new Versa has to offer. As we mentioned, this new Fitbit model is lacking in some areas, however, this is one of the top entry-level smartwatches on the market. In terms of aesthetics, the fitness tracker has a design that’s similar to the more expensive Apple watch, however, the design is a little wider and slightly lighter. It’s also not quite as bulky as competing models like the Garmin Vívoactive Smartwatch. In fact, you’ll probably forget you’re wearing it. But unlike the Vivoactive, the Versa doesn’t have built-in GPS. Instead, the device will need to connect to your smartphone’s GPS. The Versa’s new and improved today view can be accessed by swiping the watch face. This menu will display an overview of your daily stats such as workout metrics, heart rate, and steps taken. It also comes with generic info on sleep, heart health, and nutrition. This fitness tracker can store up to three hundred songs. Storing your favorite tunes is pretty simple if you have a Pandora or Deezer account. Depending on how much music you have in your song library, syncing your music only takes about fifteen to twenty minutes, via Wi-Fi. If you don’t have an account with Deezer or Pandora, you can use the Fitbit desktop app to upload songs from your PC. The Versa is considered one of the best fitness trackers for women, mainly because of its women-specific tracking features, including monitoring fertility and menstrual cycles. To use, you’ll begin by entering the day of your last period, then enter info including the length of your cycle and common symptoms. You can choose to receive one or two-day reminders, which will notify you right before your period is due and you can even enter in information regarding the type of birth control you’re on. Other information includes logging period details including the flow intensity. In terms of software, the latest software drop didn’t change much. You’ll find a variety of clock faces and apps, some of which are designed by third parties, while others come straight from Fitbit. In total, you can choose from a total of five hundred and fifty clock faces and apps. While it may sound like a great selection, when you compare the Fitbit store to major stores like Apple’s which offers thousands of options, the Fitbit store seems pretty limiting. However, if watch faces aren’t your thing, then this minor limitation shouldn’t faze you at all. We were pleasantly surprised with the Versa’s sleep tracking capabilities. In fact, it’s one of the most accurate of any model you’ll find on the market. It also provides more useful information regarding how much time you spend in each sleep stage. If you’re an Android user, you’ll have the Quick Replies additional feature, which is designed to make notifications from your smartphone more actionable. Should you receive a message sent from your smartphone you can choose to send a prewritten response. While these responses are pretty basic and consist of yes, no, and a couple of other generic responses, this feature can come in handy if you’re working out and don’t have time to grab your phone for a lengthy reply. Since this fitness tracker doesn’t have GPS, a longer than average battery life is to be expected. On average, you can probably go four days before this model needs to be charged. This means you can easily take advantage of the sleep monitoring feature and won’t have to race to recharge your fitness tracker before a run or before you head out for the day. This longer than average battery life is a huge selling point. For many, the lack of onboard GPS is a major issue, especially for those who want to avoid bringing along their smartphone when they’re going for a run. However, for the price, and the new sleeker design, many feel that the lack of GPS is a fair trade-off. Fitbit offers a more versatile fitness tracking experience compared to models of the past and includes a variety of women-specific tracking features that can add a little order to your life. Sleek, lightweight, and easy to use, we gave this model a rating of four and a half stars out of five stars.